Veteran missional leaders specifically define how established ministries can successfully parent new churches into sustainable existence. They guide you through the sponsorship sequence from its biblical foundation to the nuts, bolts, and resource basics of implementation and follow-through; and offer valuable insights regarding church splits, theological issues, and bivocational church planting. 320 pages, softcover from B&H. 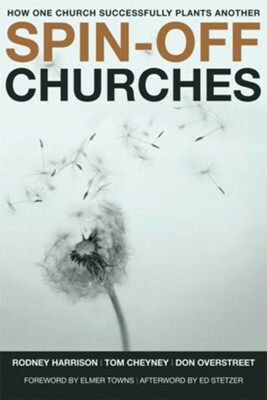 The past two decades in Christendom have brought forth a proliferation of books about church planting. One denomination (Southern Baptist) has even set a goal to start fifty thousand new churches over the next twenty year period. But what’s missing toward that end is a solid resource that specifically defines how one established church can successfully sponsor or parent a new church into sustainable existence. Spin-Off Churches aims to meet that need with contributions from a team of veteran missional church planters whose access to current church sponsorship data through the North American Mission Board is second to none. Their experience and teaching will guide readers through the church sponsorship process from its biblical basis to the nuts, bolts, and resource basics of implementation and follow through. Rodney Harrison is the current vice president and associate dean for Academics and former director of the Nehemiah Center for North American Church Planting at Midwestern Baptist Theological Seminary in Kansas City, Missouri. Tom Cheyney directs the Stratetic Resourcing Unit within the Church Planting Group of the North American Mission Board in Alpharetta, Georgia. Don Overstreet has been involved in church planting for forty years in the United States and abroad. He is a church planter strategist with the North American Mission Board of the Southern Baptist Convention in Southern California and an adjunct professor at Golden Gate Baptist Seminary. I'm the author/artist and I want to review Spin-Off Churches - eBook.